The largest nursery in Central Arkansas is Custom Landscape & Nursery, Inc.
Our company is your most reliable nursery in the area. With over 30 years of experience with plants for the commercial and residential landscape. We specialize in a broad range of plant material and work hand-in-hand with our customers to meet their demands. We follow the philosophy that each customer is unique, and provide each client with a personalized plan to fit their specific needs. 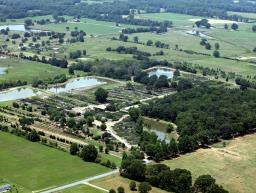 Our small town nursery sits on 80 acres of rich, fertile Faulkner County soil. We take great pride in the fact that we are family owned and operated. Our crew consists of fifteen wonderful employees, many of whom are related to one another adding to our family atmosphere. We Will Close Saturday December 22 at Noon and re-open Monday December 31.